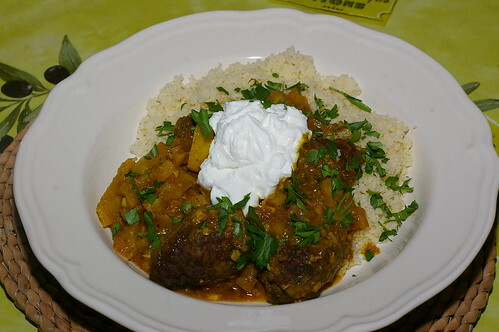 Merguez-spiced meatballs with couscous, a photo by La belle dame sans souci on Flickr. 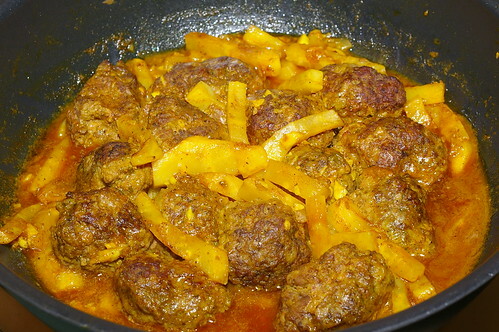 These meatballs were made from leftover sausagement from the Yotam Ottolenghi sausage rolls I made previously. I fried them in olive oil while I made a simple spicy vegetable stew with aubergines, courgettes, celery, peppers, white cabbage and onions, all cut into roughly the same-sized pieces and cooked in olive oil and flavoured with a spice mix of ground ginger, ground cumin, paprika, saffron and pimenton piccante, which was simmered with some water with the meatballs on top until the vegetables were cooked. 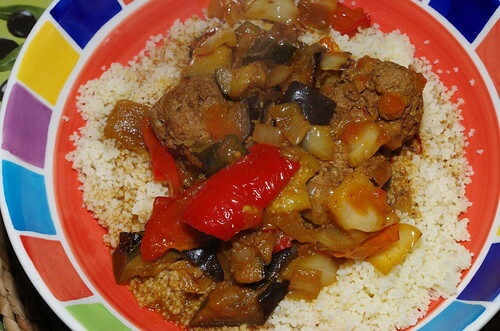 This was served with couscous and some chilli sauce to make a tasty evening meal. 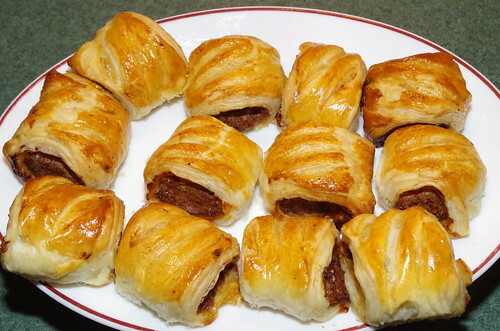 Yotam Ottolenghi’s merguez sausage rolls, a photo by La belle dame sans souci on Flickr. I cannot claim any credit for these at all, because the recipe was taken from last Saturday’s Guardian Weekend magazine. The recipe is by Yotam Ottolenghi, and I can tell you one thing about these sausage rolls – they are utterly delicious. I have yet to meet a carnivore who doesn’t love a sausage roll. This version adds a spicy, aromatic edge but is essentially the same old trick. 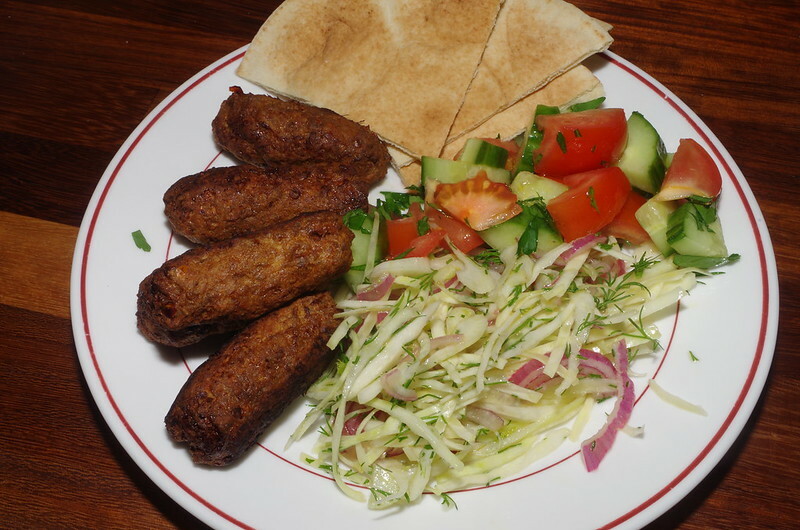 If you can’t get lamb fat, substitute 100g of the beef for some non-lean lamb mince. To simplify the dish, use a few spoonfuls of harissa instead of the spices, chilli and preserved lemon. Makes eight rolls. Heat the oil in a small frying pan over a medium-high heat. Add the onion and a quarter-teaspoon of salt, and sauté for six to eight minutes, until soft. Add the garlic, cook for 30 seconds, remove from the heat and set aside. Put the lamb fat in the small bowl of a food processor with all the spices, preserved lemon, sugar, chillies and half a teaspoon of salt. Work together to a paste, add the minced beef and the onion mix, then pulse once or twice more, just to bring the mixture together. Roll out the pastry on a lightly-floured surface to form a 35cm x 25cm rectangle that’s 0.5cm thick. Cut this in two, lengthways, and use your hands to arrange half the meat mix in a long sausage along the long side of each rectangle. Roll the pastry up and over the sausage, so it encloses it snugly – you don’t want it to be at all loose – and stop rolling 2cm before the end of the roll. Egg wash this exposed border, then finish rolling and seal it up. Repeat with the other half of the pastry and meat mixture. Leave to rest in the fridge for 30 minutes. Heat the oven to 190C/375F/gas mark 5. Cut each long roll widthways into quarters. Use a small knife to make light diagonal incisions on top of each roll and then egg wash. Place on a wire rack, with a foil-lined baking tray below (the tray is for catching the fat released during cooking, and the rack will ensure that the pastry does not get soggy) and bake for 20 minutes, until golden-brown. Remove from the oven and leave to cool slightly before eating.